We just get more and more excited about the return of Agent Carter. 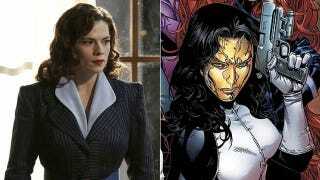 And what’s building our anticipation is the news that long-time Marvel villainess Madame Masque will be Peggy arch-nemesis in the show’s second season. Originally an Iron Man foe (and occasional love interest), Madame Masque most recently played a major role in Matt Fraction and David Aja’s excellent Hawkeye comic run, where she developed an impressive enmity for Kate Bishop, the second Hawkeye after Clint Barton. In the comic-verse, Masque is a former debutante named Whitney Frost who became one of the criminal masterminds leading Marvel’s version of the Mafia (called the Maggia); she wears a golden mask after her face is scarred (it’s since been healed, but she’s continued wearing the mask). Is it significant that the villain is a woman? Tara: For me it is, because I feel like that is something that… as much as there are not enough female heroes just on television, I feel like having a female villain is just as equally powerful. As much as I’ve dreamed of somehow seeing a live-action MCU version of the Fraction/Aja Hawkeye series, I have zero problems with Madame Masque being repurposed to battle Agent Carter. Besides, I think Hawkeye’s weird farmstead in Age of Ultron ruined my chances of ever seeing Pizza Dog on-screen anyways.